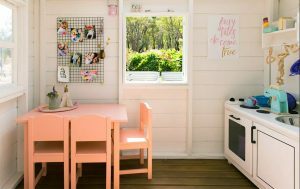 When it comes to building a storage shed that doubles as a cozy place to hang out with the whole family, there are some things you need to consider before you get the hammer and nails out. A standard size for a normal storage shed is 8x8x8 because plywood sheets for the sub-floor and exterior sheathing are 4×8 feet (32sq ft) in size. This size eliminates wasted material and makes the construction process easy; however, this size will not be big enough for this project. 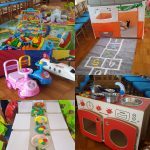 For this particular project that was provided by HowToPlans.org, we will increase the size to 12x12x8. The same mathematics for the 4×8 sheets of plywood will still apply and provide adequate space for a family room. An interior partition wall will be installed to provide a capacious 4×12 storage area and a cozy 8×12 family room. You need to figure out where you want your shed to be located? Find a location that is on the higher-flat ground if possible. Avoid building your shed on top of underground wiring, gas lines or septic systems which includes the PVC drain line to the holding tank. Most municipalities require a building permit for structures that increase property value. Unfortunately, it also increases your property taxes. 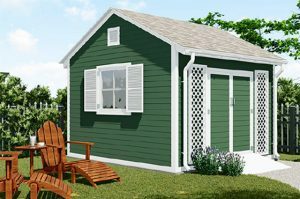 The best option to supply your shed with 24/7 electrical power is by running 14/2 Romex cable (12 inches underground housed in one inch PVC) from the main breaker box of the house on its own 20amp breaker to the shed or for temporary power use a portable generator. A standard 36-inch exterior metal entry door is a good option for the main entry into the family room. If you want access to the storage room from inside of the family room, install an interior door in the partition wall. For access to the storage room only, install another exterior entry door on the storage side of the shed or build barn-style doors to drive in lawnmowers, ATVs, snowmobiles, etc. They are optional, but they do provide cosmetic value as well as fresh air flow when needed. Standard size 3×3 foot vinyl double-hung windows are affordable and will work just fine. Depending on where you live, how much you plan on using the shed, and what will be kept in the family room, heating should be considered. There are a number of sources available like electric baseboard heaters, LP fireplaces, electric ceramic heaters, propane tank heaters, and wood stoves. A small air conditioner with 5000 BTU will work just fine in this space. Instead of mounting your AC in a window, make a rough opening in the exterior wall one half of an inch bigger on all sides of the unit. This will allow room for a replacement AC if you can’t find the same size as the one you’re installing. A concrete slab will provide a solid floor that will last a long time, and it’s a very solid foundation for your shed. You will need to excavate six inches of earth in your marked-out 12×12 location. Fill the hole with four inches of compact gravel. Build a 12×12 wooden form, and fill it with four inches of concrete. This will provide two inches of clearance above ground level to prevent water from entering the structure. Pressure-treated timber is chemically treated timber that is designed for outdoor elements. It won’t rot, mold, or be a haven for insects. If you build your floor foundation with kiln-dried timber, chances are in a few years you will have some type of issue on your hands. Build a 12×12 frame with four pieces of 2x6x12 pressure-treated timber, then add eight more pieces of 2x6x12 pressure-treated timber on the inside of the frame 16 inches on center. Once your frame is complete, take two diagonal measurements in an “X-Shape” until both numbers match. Use temporary bracing to keep it square while you mount it to your supports. You can use cardboard concrete form tubes or 4×4 concrete blocks to place your pieces of 4×4 pressure-treated support columns on. Cut them a few inches taller than your floor height, this will allow you to level the open studded floor frame, and secure it before you cut them off flush. Then cover the deck with four and one-half pieces of 4×8 pressure-treated tongue and groove OSB sub-flooring. If you want a warmer floor, install two-inch foam board between the floor stringers before you deck it over. Supports under each corner, one in the middle between the corners, and three down the middle will work great for a solid floor. A pressure-treated foundation will last decades, and there’s not a lot of earthwork to prep. Additionally, it can be built on the uneven and above ground. Depending on the integrity and how strong you want your walls to be, you can build them with kiln-dried 2×4 or 2×6 lumber. You will need 12 pieces that are 12 feet long for a single plate on the bottom of the wall and a double plate on the top. You can secure the framework with framing nails, deck screws or use an assortment of metal fasteners (optional) in addition for added strength. If you are building on concrete, install a layer of foam sill seal between the concrete and bottom wall plate. Next, you will need 24 pieces that are eight feet long for the wall studs and up to 10 more for making window sills and door/window headers. Additionally, they will be used for temporary bracing as your building your walls to keep them level and square. Keeping in mind, the overall height is eight feet (96 inches), so one bottom plate and two top plates are four and one half inches thick. Your wall studs will need to be cut at 91.5 inches. Before you build the walls, this is a good time to figure out where the windows and doors are going to be placed. Make all of your rough openings one-half inch bigger on all sides than the window or door. Make box-style headers for the windows and doors, and double plate the window sills. 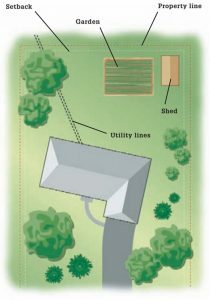 A good building tip is to build one wall at a time laying down on the floor of the shed. This allows for easy assembly, and the same diagonal “X-shape” can be used to square the wall, then you can sheath the wall at the same time before you stand it up. To figure out how much sheathing you need, add up your total square feet and divide by 32. Match the siding to your house, and you can figure out how many square feet you need by the same number you used for the sheathing. Divide it by how many square feet come in a box. If your building on concrete, let the bottom of the sheathing overhang two inches on the bottom of the wall. For a pressure treated floor, let the sheathing overhang six inches. What this does, it adds more protection on a concrete floor design to prevent an entry point for water, and it does the same thing for a pressure-treated floor with the bonus of having more area to secure the walls in place. Don’t add your second top plate until all four walls are up. You want to overlap the corners with your second top plate. This locks the walls in tight and keeps the structure square. Use your extra timber for temporary bracing attached to the exterior walls both to the ground and inside of the structure. These can be removed once the roof is installed. The same thing applies to the timber selection for your roof trusses, either build them with 2×4 or 2×6 kiln-dried timber. You will need five 12 foot pieces for each truss. You will need two gable ends and eight trusses in the middle that follow the same layout as your floor stringers. Once you figure out your angles and length for one truss, number them, and use them as a pattern to cut the rest of the trusses. Now you can add the facial boards and finish the trim work. Then, cover your roof with tongue and groove OSB sheathing, and install tar paper and metal drip edge for asphalt shingles or install a metal roof system. Add a metal junction box where the 14/2 Romex wire enters the structure. Mount all of your plastic boxes for light switches, lights, and receptacles. Use 12/2 Romex wire from the junction box to run all of your wirings by drilling holes through the wall studs. To add insulation for a 2×4 wall use R-13 insulation, for 2×6 wall use R-19 insulation, and for the ceiling use R-30 insulation. To put the finishing touches on your interior you can drywall, paint, trim, and add your choice of flooring. This will be the family room shed in the neighborhood. The last thing to do is to hook it up with an entertainment system, mini-fridge, microwave, furniture, and members of your family.